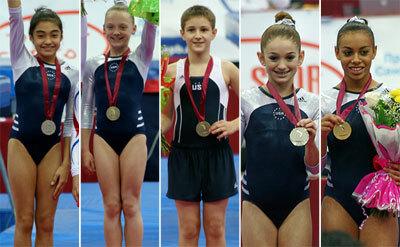 ST. PETERSBURG, Russia, Nov. 20, 2009 – The USA won five medals on the final day of the 2009 World Age Group Trampoline and Tumbling Competition in St. Petersburg, Russia. Kiara Nowlin of Oxnard, Calif., won gold; Shaylee Dunavin of Amarillo, Texas, and Felicia Hano of San Gabriel, Calif., won silvers; and Hannah Nowak of Washington, Ind., and Brandon Krzynefski of Centreville, Va., and won bronze medals. The USA earned 12 total medals at the competition. Nowlin and Dunavin took the top two spots in 13-14 double mini-trampoline, winning gold and silver medals with 66.900 and 66.200. Tristan Van Natta of Markleville, Ind., just missed the bronze medal, losing out to Canada’s Alexandria Giesbrecht on a tie-breaker at 66.100. Arseny Samonin of Russia won the boys’ title with a 66.100. The USA won the silver and bronze medals in 11-12 girls’ tumbling with Hano (30.100) and Nowak (30.100), respectively. Emily Marsden Payne of Great Britain won the gold with 31.200. Russia’s Ivan Shevchenko won the gold medal in boys’ 11-12 tumbling with a 31.000. Krzynefski took the bronze with 30.700. Ryota Shimada of Japan won the 17-18 boys’ trampoline title with a 39.200. Volha Kapustsina of Belarus took the girls’ title with 36.400. Daiki Kishi and Ginga Munetomo of Japan won the gold in 15-16 synchronized trampoline with 46.800. Clara Beatriz Porreca and Daienne Lima of Brazil took the women’s title with 44.600. Other U.S. gymnasts that competed in finals today are: Tristen Northrup of Ogden, Utah; Nathan O'Connor of Peoria, Ill; and Jessica Allen of Kenner, La. Events qualification and finals will take place each day on every apparatus for boys and girls of the same age group. For a complete list of qualifications and results, click here.